These Meal Prep Banana Egg Pancakes are a delicious grab & go breakfast idea made with just two ingredients: eggs and bananas! Mash bananas together in a large bowl then whisk in eggs. Heat butter in a large frying pan over medium heat and add about 1/4 cup of pancake batter at a time, cooking for 3-4 minutes per side until fully cooked. 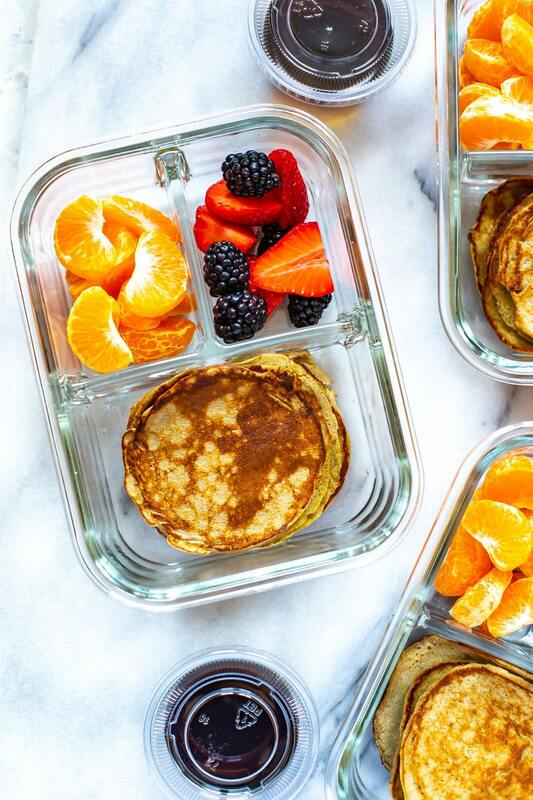 Add pancakes to meal prep bowls along with fruit and maple syrup on the side (optional). Will keep in fridge up to 5 days. To freeze: Stack pancakes in between wax paper and store in a resealable plastic bag. Microwave for 1-2 minutes to reheat.